It's the most wonderful time of the year!! It's finally Christmas time and if you know me or follow me on Twitter you will know that I am basically an elf so it's Christmas in full force on my blog and social media! 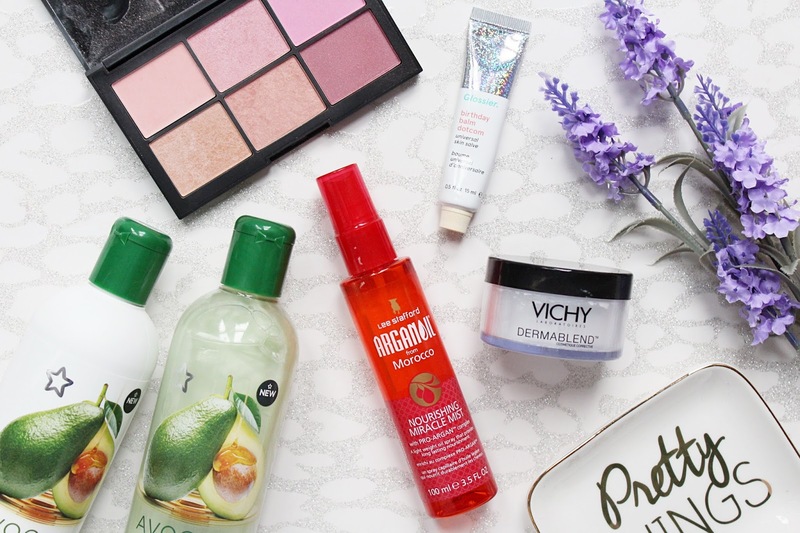 This past month I have been rediscovering a lot of old favourites as well as having two new favourite products that I just can't get enough of. A few months ago I reviewed the Superdrug Avocado & Manuka Honey Shampoo & Conditioner and I really enjoyed using them but I am always trying new things so I had switched to something else. My hair has been such a struggle to brush, it's like a birds nest and I have no idea how it happened, I have never had this problem before. It was also so dry and it left like straw so I decided to get these back out and I am so glad that I did! These have made my hair so much more manageable, easier to brush and it doesn't feel dry at all anymore. Another hair care favourite of mine is another old favourite which is the Lee Stafford Argan Oil From Morocco Nourishing Miracle Mist. This has injected so much hydrating back into my hair while leaving it feeling super soft and sleek. I have also noticed that it leaves my hair smelling lovely too! I bought the NARS Unfiltered II Palette a while ago now and I loved it for quite a while but I had completely forgotten about it as it was at the back of one of my drawers. I dug it back out again and I have been using it every day since! These blushes have great pigmentation as they aren't too intense that you have to worry about applying too much but they show up well on the skin and you get a great variety of shades. I have been really loving the baby pink and the berry shade this month. The packaging of this palette is stunning too, I love the pink mirrored front but I just wish that they were still cruelty-free so I could try some more products from them. If you saw my Glossier haul (you can check that out here) you will know that I went a little mad. 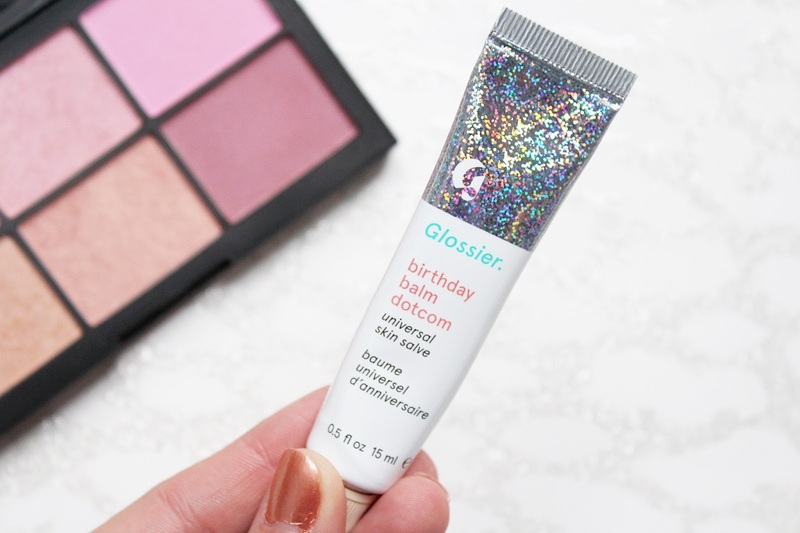 I have been loving everything I picked up and have been using them all so much but the one product that has stood out to me is the Balm Dotcom Birthday Edition. This is a multipurpose balm which I have been mainly using on the lips and this version smells like the most delicious cake you have ever come across and has glitter in. It looks stunning on the lips and it hydrates and moisturises like no other balm has. I was having a few issues with my cuticles being dry and I used this on them for one night and they were back to normal by the next morning! If you want 10% off your first Glosser purchase, use this link. And my final favourite product this month has been the Vichy Dermablend Setting Powder. I have loved the Dermablend foundations for well over a year now and this powder is incredible stuff just like the foundations! It sets my makeup so well and makes it last so much longer! I have always struggled with my foundation settling into my smile lines and this powder prevents that happening all day long. 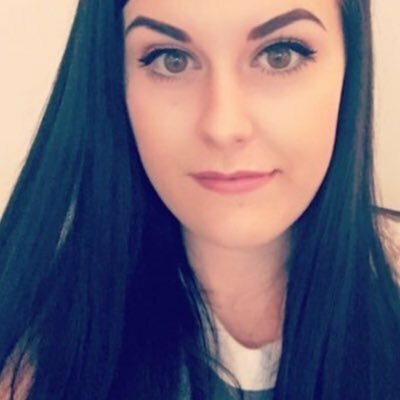 It leaves my skin with a natural matte finish that never looks at all powdery. I use this to set under my eyes and my foundation and it works so well for both areas. I have also noticed that it keeps any oil at bay too.